The Majesto reception desk is presented with coloured metallic or wood effect melamine external cladding. The desk is robust in appearance and build with the desktops and countertops being 38mm thick compared to the standard 25mm. The desktops are pre-fitted with cable ports in an aluminium grey finish (except on the DDA low units). A number of accessories are also available with the majestic range including a white or aluminium countertop shelf and countertop shelf with LED kit. Storage units are also available to complement the range and facilitate storage requirements. The aluminium metal and white and amber walnut melamine is available on standard lead time of 2 weeks and the metal coloured cladding in white, red, aniseed green, blue and plum are on a 6 week lead time. For commercial applications the reception desk can be one of the most important pieces of furniture. For example, in a business environment the reception desk is often where employees will first meet potential new clients as well as existing customers. Selecting the right desk to convey the appropriate image is important as this can heavily influence the client’s first impression of the business. 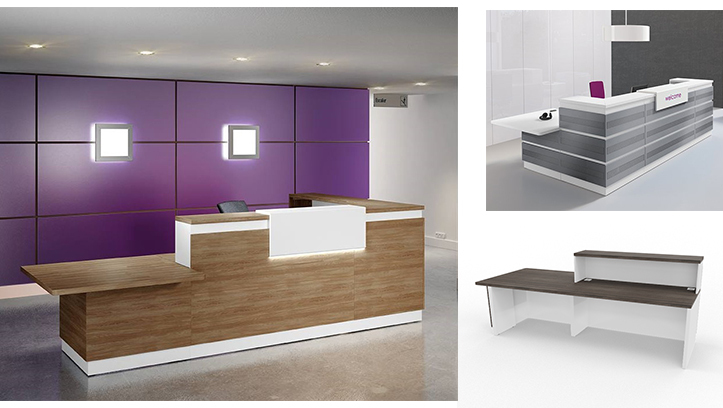 The Majesto range of reception desks provides a selection of attractive desk solutions that feature unique designs and are available in a number of bright colours. We provide several styles of the Majesto desk here which feature coloured metal cladding built upon durable MFC. Many of the Majesto desks have features unique to this range such as the option of personalised lettering, the option of LED lighting and the ability to adjust the height of the desk to suit wheelchair users. The modular style of this desk range gives it the capability to be set up in a variety of different ways and so is built in a number of ways to suit different needs. If you are looking for a clean, stylish and modern reception desk that is great value for money then the Majesto range is for you. We also deliver the Majesto range of reception desks for free to UK mainland addresses and provide a free install service with all of the items in this range.